In two years as a decision-making duo, Howie Roseman and Doug Pederson lifted the Eagles to never-before-seen heights. And ownership wants no part of a near-future breakup. The Eagles extended both the GM and their third-year head coach on Sunday, with these new deals running through the 2022 season. Pederson’s initial Eagles contract ran through the 2020 season, and the team picked up the HC’s fifth-year option recently (per Jeff McLane of Philly.com, on Twitter). So it’s not a big surprise to see the franchise extend that for two more years. In his second season as a head coach, Pederson guided Philadelphia to its first Super Bowl championship and first NFL title since 1960. And he did so after the team’s starting quarterback was lost for the season in December. Roseman’s path may be even more stunning. Demoted in 2015 in order to give Chip Kelly decision-making power, Roseman returned in 2016 and set out to fortify the team’s core with a slew of extensions that year. That helped lead to the Eagles’ Super Bowl run, and Roseman’s 2016 deal to move into position to draft Carson Wentz has the franchise set up long-term at sports’ premier position. Roseman earned multiple executive of the year honors for his 2017 work. Pederson, 50, rejoined the Eagles after three years as Andy Reid‘s offensive coordinator with the Chiefs. And after a 7-9 season in Wentz’s rookie year, the Eagles stormed to the NFC’s No. 1 seed and notched three upset (by point spread) victories to secure the Super Bowl LII championship. 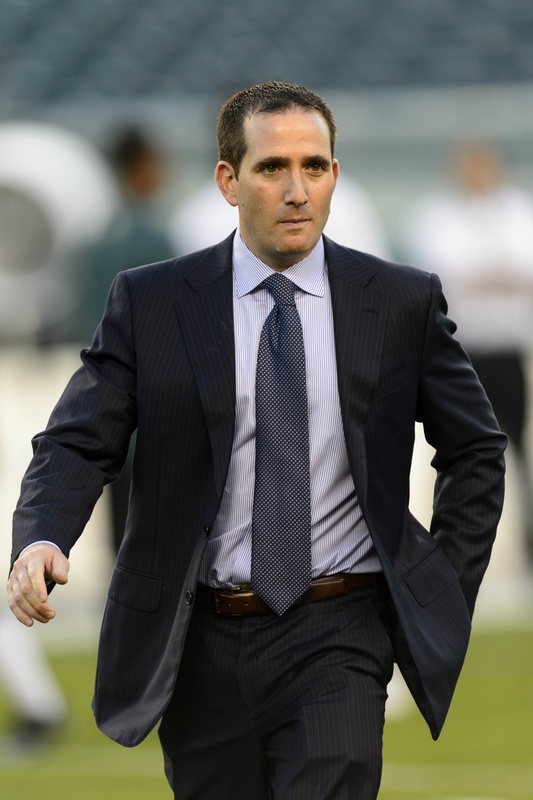 Roseman, 43, has been with the Eagles since 2000 as a salary cap staffer. He ascended to the GM role in 2010 and was reinstated in that position after Kelly’s ouster late in 2015. With Wentz back and Super Bowl MVP Nick Foles serving as the NFL’s top insurance policy, Roseman and Pederson have the Eagles positioned as a top threat to become the first team to win back-to-back Super Bowls since the 2003-04 Patriots. With the selection of Sam Darnold at No. 3 in the 2018 NFL Draft, the Jets brought their quarterback room to five. The USC product joined Josh McCown, Teddy Bridgewater, Bryce Petty and Christian Hackenberg. Newsday’s Calvin Watkins, however, notes that number is expected to shrink by the time the team heads to training camp in July. The two obvious candidates to be moved or released are Petty and Hackenberg. The former has failed to impress in seven starts, and the latter, despite having a cannon for an arm, has yet to make an appearance in his first two seasons. Even if one of the two make it to training camp, another move is likely to come as keeping four quarterbacks would handicap the team at other positions. In addition to Darnold, it would be hard to see the veteran McCown not making the squad. The journeyman is viewed as invaluable in the locker room and is the perfect candidate to help the young Darnold learn the ropes of the NFL. Bridgewater, however, is no lock to make the roster. As Watkins notes, the former Vikings signal-caller receives a $5MM base salary if he makes the team. If not, the Jets are only out the $500,000 signing bonus. If he proves he is back to his pre-injury form, New York will have a steal. If not, the team can cut bait with minimal salary implications. The Broncos did not endure a turnover in the scouting department following this weekend’s draft, 9 News’ Mike Klis tweets. In the wake of the annual draft, it is not uncommon for teams to part ways with scouts and personnel department. Team president John Elway, however, decided to bring everyone back. The Chiefs hired Eagles assistant director of college scouting Michael Bradway to an undisclosed position, Geoff Mosher of 97.5 The Fanatic in Philadelphia tweets. Mosher notes Bradway, who was with the Eagles for seven seasons, joins back up with Chiefs general manager Brett Veach, who also spent time in Philadelphia. The Giants attempted to trade into the back end of the second round to select Georgia linebacker Lorenzo Carter, the New York Post’s Paul Schwartz writes. Though a deal did not form, New York was still able to pluck the speedy edge rusher when he fell to their third-round pick (No. 66). “What you have to appreciate is his unseen production. If he is flying off the edge, he is creating pressure. Sometimes you are looking at guys that create plays for others.,” general manager Dave Gettleman said. Vikings center Pat Elflein is doing “part work” in spring drills but is not going to be ready for OTAs, the player told Chris Tomasson of the St. Paul Pioneer Press (Twitter link). Elflein suffered a fractured left ankle in the NFC Championship game on Jan. 21 and underwent surgery the following week. “We’re just not rushing it. I’m just trying to get myself back in shape and get strong and be ready to go.,” Elflein said. Harrison Smith underwent ankle surgery in February but is expected to be ready for training camp. The Vikings‘ top defensive back is ahead of schedule in his recovery from the left ankle operation, per Chris Tomasson of the St. Paul Pioneer Press, but the team is expected to be cautious with him this offseason. A high ankle sprain hampered Smith toward the end of last season, and although the Pro Bowl defender returned for the Vikings’ final two games after missing two in December, a corrective procedure became necessary. A source informed Tomasson that Smith opted for surgery after playing on the injured ankle in the Pro Bowl led to it “getting worse.” Smith will enter the first season of his five-year, $51.25MM contract in 2017. Jerry Jones acknowledged the Ezekiel Elliott video that emerged via TMZ last month is “not good.” The video shows the Cowboys running back lowering a woman’s top on a float at a Dallas St. Patrick’s Day parade. “There is not much that I want to say other than that was unfortunate and not good,” Jones said, via the Dallas Morning News,” Jones said. “It wouldn’t be the right emphasis one way or the other to get into any communications or dialogue since that happened. … I wouldn’t want to say on communication, but I’m aware of the incident and I’m aware of the criticism.” Representatives of the 21-year-old Elliott expect him to be cleared of wrongdoing in a 2016 domestic violence case, but this incident adds to a growing list of off-the-field drama for the talented back. The Rams did not pursue T.J. McDonald or Case Keenum in free agency, according to the Los Angeles Times. An impending eight-game suspension reduced interest in McDonald, who landed with the Dolphins. Keenum signed with the Vikings. Howie Roseman‘s given more power over the Eagles‘ draft board to VP of player personnel Joe Douglas than he did previous lieutenants Ryan Grigson or Tom Gamble, Jeff McLane of Philly.com writes. “The draft is going to be really built by Joe,” Jeffrey Lurie said, via McLane, before adding “the final decision will be made by Howie.” This will be Douglas’ first draft with the Eagles after landing in Philadelphia last May. McLane writes this will take some of the prospect-evaluation burden off of Roseman. The Cardinals do not look set to add any notable help at either running back or wide receiver. Bruce Arians said (via Kent Somers of AZCentral.com) the team is content with what it has there. The fifth-year Cardinals coach noted Kerwynn Williams can be the No. 2 back behind David Johnson, and the coach expects a healthier season from John Brown. Somers notes depth pieces could come via lower-round picks or UDFAs, but it appears Arizona will address other positions with its higher draft picks. Tim Hightower‘s 49ers deal is a one-year agreement, according to Nick Shook of NFL.com. The former Cardinals, Redskins and Saints back will turn 31 in May. 49ers fans have been waiting for the better part of a month for the organization to hire their next head coach and general manager. The team will seemingly have to wait at least another two weeks to hire frontrunner Kyle Shanahan from the Falcons, and they may be waiting a bit longer to bring in a new general manager. On Tuesday, CEO Jed York preached patience when it comes to the team’s hirings. “The message is we’re going to re-establish a championship culture,” York said (via Cam Inman of The Mercury News). “We’re not going to do that by filling a job quickly. We need to be patient. We need to be willing to wait. The Eagles traded former second-round pick Eric Rowe to the Patriots earlier this season, and the cornerback proceeded to start seven games for the AFC champs. Roseman provided some logic for cutting bait on the promising defensive back. “When we sat down and discussed the offer, we really started thinking about the likelihood that we had to sign him to an extension,” Roseman said (via Reuben Frank of CSNPhilly.com).“We want to build this team with some continuity. We felt at that time that we were not going to sign him to an extension and to be able to get that value for him and possibly add someone who would be here for a longer period of time made sense for where we were. ” Rowe’s contract expires following the 2018 season. Perrish Cox‘s new one-year contract with the Seahawks is worth $855K, reports ESPN.com’s Sheil Kapadia. The cornerback’s initial cap hit is $680K, and he’ll earn $443K if he suffers an injury prior to the start of the regular season. Cowboys CEO Stephen Jones said his team would like to keep free agent wideouts Terrance Williams and Brice Butler (via Brandon George of The Dallas Morning News on Twitter). Williams had one of his least-productive seasons in 2016, but he still finished the campaign with 44 receptions for 594 yards and four touchdowns. Butler, a former seventh-round pick, finished the season with 16 receptions for 219 yards and three touchdowns. Jones also passed along that Cowboys defensive end DeMarcus Lawrence will need back surgery for the second straight offseason (via George on Twitter). The former second-round pick has only played in 32 games over his three seasons in the NFL, including nine games (three starts) in 2016. The Rams, 49ers, Jaguars, Chargers, Bills, and Broncos are all in search of their next head coach. The Eagles won’t create a seventh NFL head coaching vacancy this offseason. The Eagles will retain coach Doug Pederson as well as executive vice president of football operations Howie Roseman and vice president of player personnel Joe Douglas, according to a team source who spoke with Zach Berman of the Philadelphia Inquirer. 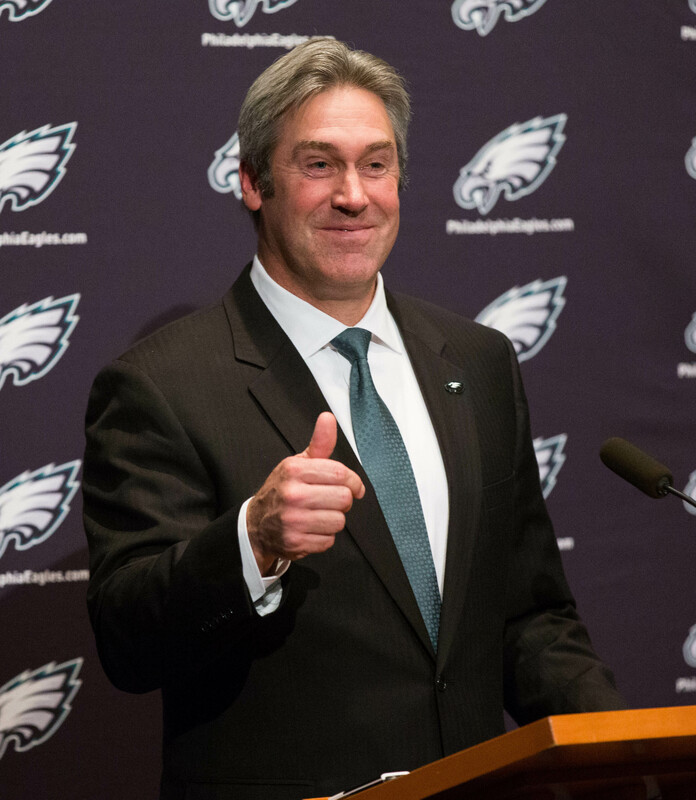 Although the Eagles were hoping to do better than 7-9 this year, few expected the team to fire Pederson after just one year at the helm. Roseman only recently wrestled back control of the front office after the Chip Kelly ouster and there wasn’t much talk of him getting the boot either. Roseman has been with the organization since 2000 and has a strong relationship with team owners. Of course, the return of Pederson, Roseman, and Douglas doesn’t mean that there won’t be other changes made. The Eagles’ first-round pick (No. 12) is owned by the Browns. However, they’ll be picking at either No. 14 or No. 15 thanks to the pick they acquired from the Vikings in the Sam Bradford trade. Prior to being reinstalled as the Eagles’ top decision-maker following an eventful and dysfunctional 2015 Philadelphia campaign under Chip Kelly, Howie Roseman feared he wouldn’t receive another opportunity to call the shots for a team, Jeff McLane of the Philadelphia Inquirer reports. The current Eagles GM met with former executives who made the transition to television, per McLane, before his fortunes changed and the organization ended up siding with him over Kelly. This turned out to be the second straight eventful offseason for the franchise after it made trades to acquire Carson Wentz and deal away Sam Bradford, and McLane estimates owner Jeffrey Lurie being patient with Roseman this time around. Both the 41-year-old GM and Wentz’s deals expire after the 2019 season, although the rookie quarterback has a fifth-year option, and McLane envisions neither being permitted to enter their walk years without an extension. Under Roseman’s direction from 2010-14 and this season, the team is 47-42 with three 10-win seasons — but no playoff victories — so the exec’s future is inextricably tied to Wentz, who is the fourth Eagles QB to start a season in the past seven years. Here’s more coming out of Philly as the team prepares for a crucial tilt against the Seahawks. As the Eagles venture to Seattle, their top pass-rusher could find himself in the same position the Seahawks’ best option does. Brandon Graham will enter the third season of what now looks like an incredibly team-friendly four-year, $26MM deal agreed to during Kelly’s run, and NJ.com’s Eliot Shorr-Parks argues the team should reward Graham with a new deal in 2017. Michael Bennett‘s regretted the four-year, $28MM pact he agreed to in 2014, and Graham — currently the third-highest-paid edge-rusher on his own team behind Vinny Curry and Connor Barwin — potentially could soon after breaking out upon being moved to defensive end. Only Von Miller and Aaron Donald have more pressures and sacks combined than Graham’s 46, and with the spree of extensions Roseman’s handed out this year, the franchise has shown it’s willing to reward its own. While redoing a contract less than halfway through it would set an interesting precedent during the Roseman 2.0 era, Shorr-Parks writes a new accord could lessen the 28-year-old Graham’s $7.5MM cap hit next season for a team that’s seen those 2016 re-ups leave it with barely $5MM in cap space come 2017. Philly’s still gunning for a playoff spot despite low expectations for 2016, but Shorr-Parks notes cornerback is squarely atop the team’s needs hierarchy going forward. The Eagles traded Eric Rowe to the Patriots and will see Nolan Carroll‘s contract expire after the season, leaving the team with Jalen Mills, an aging Leodis McKelvin and UDFAs at the position going forward. Although the Eagles selected Rowe in the second round, Philadelphia hasn’t taken a corner in the first since Lito Sheppard in 2002. Roseman’s extension string continued with the team locking up three role players — special-teamer Chris Maragos, punter Donnie Jones and long snapper Jon Dorenbos — on Friday. Bennie Logan could be next in line for one as well in a scenario that would make it easier to list the Eagles who didn’t receive an extension. The Darren Sproles extension follows a trend by the organization to extend their veteran players. As Jeff McLane of Philly.com writes, the team has already wrapped up 31-year-old tight end Brent Celek and 34-year-old offensive tackle Jason Peters this offseason. However, executive vice president of football operations Howie Roseman said the team isn’t following any set rules. Instead, Roseman believes extending his veterans sends the right message to their younger teammates. Chip Kelly told Philadelphia-area media, including Jeff McLane of Philly.com, he didn’t communicate directly with Howie Roseman last season before being fired by the Eagles. The current 49ers coach said owner Jeffrey Lurie constructed an arrangement where the then-demoted Roseman sent messages to the then-empowered Kelly through player personnel VP Ed Marynowitz. Kelly also asserted he didn’t control the contracts given to Byron Maxwell and DeMarco Murray, with the three-year Eagles coach telling media Roseman, who has since traded both players, constructed those deals. “I wasn’t the personnel guy. I was in charge of the 90-man roster,” Kelly said. “But I didn’t negotiate and say this guy gets this amount of money and that guy gets that amount of money. And Ed was the one who ran our personnel department. That really fell on Ed’s shoulders in terms of how he handled everything. And Ed communicated with him all the time. Here’s some more on the Eagles and news from some additional NFC teams. Former Eagles first-round linebacker Marcus Smith will move to defensive end in Jim Schwartz‘s 4-3 scheme, Zach Berman of Philly.com reports. Doug Pederson told media, including Berman, his linebackers right now will consist of Mychal Kendricks on the weak side, Jordan Hicks in the middle and Nigel Bradham on the strong side. The Vikings inquired about Rueben Randle early in free agency, Darren Wolfson of KSTP tweets, but no substantial interest materialized prior to Randle choosing to trek to Philadelphia. The Giants, however, had no interest in re-signing Randle, Jordan Raanan of the Star-Ledger tweets. John Mara said last week the Giants were going to seek receiving help, but the market has been mostly raided in terms of notable first-time free agents. Veterans Roddy White, Marques Colston and Percy Harvin remain unsigned. The Cowboys are expected meet with Paxton Lynch again before the draft after doing so in a productive meeting today, NFL.com’s Rand Getlin tweets. Dallas is allotted 30 visits with prospects. Washington safety Kyshoen Jarrett‘s status is uncertain for this season, with Jay Gruden telling media — including JP Finlay of CSNMidAtlantic.com — he’s “very concerned” about the lack of strength in Jarrett’s shoulder presently. A key backup and part-time starter as a rookie last season, Jarrett was injured in Week 17 against the Cowboys. After having announced last month that they intended to hire a new front office executive to serve as their head of player personnel, the Eagles have put that search on hold for now, reports Geoff Mosher of EagleScoutingNest.com. According to Mosher, the Eagles aren’t expected to hire a personnel chief until sometime after the 2016 NFL draft. Having parted ways with head coach Chip Kelly and top personnel executive Ed Marynowitz several weeks ago, the Eagles are seeking a high-ranking senior executive to lead the scouting department, but the timing of their search may have limited their list of potential candidates. As Mosher explains, most NFL teams are currently “knee deep in the pre-draft process” and would be hesitant about allowing a top personnel executive to leave. The team did meet with several candidates, including Brandon Hunt, Morocco Brown, Dwayne Joseph, and Mark Dominik, tweets Jeff McLane of the Philadelphia Inquirer. And as Les Bowen of the Philadelphia Daily News tweets, it’s possible that the team has already reached an agreement with a candidate who isn’t free until after the draft. For now though, Philadelphia looks poised to head into free agency and the draft with Howie Roseman making many of the key decisions. Tom Donahoe and new head coach Doug Pederson also figure to be involved in the process, but as McLane writes, Roseman will be the one making the final decision on roster moves. Even if the team intends to resume its search after the conclusion of this year’s draft, there’s some skepticism around the league that the Eagles will be able to attract top candidates for the position, says Mosher. While Philadelphia doesn’t currently have a general manager, the team’s front office opening isn’t exactly a GM position, and Roseman figures to maintain final say on personnel decisions, so rival executives may not view it as a significant promotion. As Mosher notes, Kelly was in a similar position last year when tasked with replacing Tom Gamble, and had difficulty attracting an outside personnel exec — he ultimately promoted Marynowitz. It’s been a busy week so far for the Eagles, who signed a pair of tight ends to new contracts and are still looking to hire a key personnel executive for their front office. Let’s check out the latest out of Philadelphia…. Using the contracts signed last winter by Julius Thomas and Charles Clay as points of comparison, Jason Fitzgerald of Over the Cap breaks down Zach Ertz‘s new deal with the Eagles. Fitzgerald also explains why Brent Celek‘s extension has plenty of value for Philadelphia, assuming the team had already decided to carry the veteran tight end on its roster for 2016. Josh Paunil of PhillyMag.com spoke to former agent Joel Corry about the likely value of potential extensions for players like Fletcher Cox, Lane Johnson, and Vinny Curry. Corry also explained why he thinks Sam Bradford may ultimately sign a one-year contract this offseason rather than a long-term deal. If the Eagles know whether they plan re-sign Bradford or let him walk, they’re not tipping their hand yet, as Bowen details in a Daily News piece. Bowen and Geoff Mosher of CSNPhilly.com (Twitter links) are both hearing rumblings that the personnel executive ultimately hired by the Eagles to work with Roseman will be a retread, rather than an up-and-comer. The Eagles have hired Missouri’s Chris Wilson as their defensive line coach, Doug Pederson said today, per Jeff McLane of the Philadelphia Inquirer (Twitter link).